It's that time of year again: back to school! A total of 1,019,206 pre-school, primary, and secondary school pupils were back in the classrooms on Wednesday morning. On Friday it will be the turn of college, language school, vocational, and other students. This will bring the total to 1,567,316 students enrolled, 1,299 more than last year. In order to meet the needs of an increase in students, 690 teachers have been incorporated into the system. This is the maximum quantity allowed permitted by the current budget situation. A total of up to 71,865 teachers will be taking the charge of educating the next generations of Catalonia. The start of the school year has also been marred by unfinished works in 21 education centres. In some cases these delays have been caused by the application of Article 155, while heavy rains during the summer have also made their effect known and set back projects. 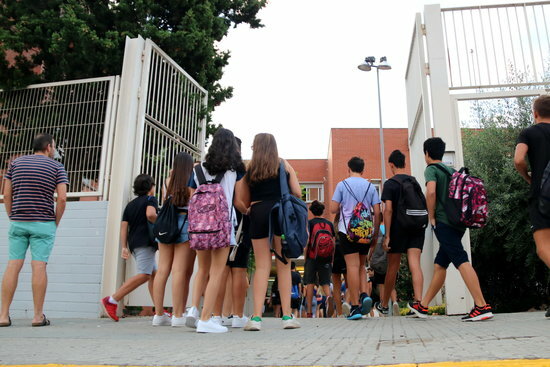 The education minister, Josep Bargalló, has said that the 2018-2019 year will move forward, following a pact against school segregation to avoid pupils from poorer backgrounds being left behind. To make this possible, admission terms will be modified, and the actions of some semi-private centres that could carry out discriminatory practices will be controlled. The education department expects a continuation of innovation this school year. It wants to promote digital competence and create new types of training for teachers.